Make beautiful cross stitch buttons to add an extra va va voom to your wardrobe! Because we all know that accessories change an outfit what better way is there then adding some personalized buttons to recycle an old favourite frock, a boy friend shirt or even to funk up a hand bag! Get to grips with basic cross stitching in this fun 2 hour work shop. To book your place please contact the tutor directly. Price per student: £9.00* includes all material and use of tools. Only a week and a half to go and we're raring to set down our knitting needles to craft with some fine people. As part of the Thames Festival,The Craft Trail has been created to offer visitors the complete LONDON hand made experience! We have a selection of designer makers selling directly to the public with Crafty Fox and We make London. They'll be dotted around the trail in two specific areas...just follow the map! Craft Guerrilla will set up near City Hall with Sanna Panda, Cabbages & Kings, Creative Biscuit and a few other crafty people. You'll be able to see the best talent in printing, design, buy craft materials and supplies to sipping tea in the "Alice in Wonderland" café shop. Craft Guerrilla will be offering two days of work shops hosted by guest tutors. Learn to make Dorset Buttons, Recycled Note Books, make your own wristie pin cushion, print your own little bird, learn to knit and much more! Below is a schedule of workshops with more to be added on the day. To find out what we'll be doing follow us on twitter. We'll be popping up for a couple of GUERRILLA KNITTING sessions so keep your peepers firmly on Twitter!!!! *6pm onwards "CHECK TWITTER" (@craftguerrilla) NUDGE NUDGE, WINK WINK! Tech fail...now who can help? Besides myself I think there are quite a few people experiencing the same Blogger issue. We're in need of assistance over one simple little thing which seems to have no easy or straight forward answer. You'd think the solution was obvious as Blogger is normally easy and friendly to use. BUT...no not on this occasion! How do you add the "pages" bar under the blog banner so you have all your info neatly organized on blogger? It doesn't seem to allow more then one page. Yep, I've found a few forums, I've followed Bloggers instructions when adding the gadget to "drag down to change order of pages"...DRAG DOWN??? Drag down to where exactly??? And it's only the one page...I need at least 4!!! I'm confused and normally I'm what I think a bit of a whiz when it comes to Blogger but this...heck this has got me stumped! Plus the annoying bit is that we had a web designer staying over for a few days and I completely forgot to ask him to fix it. Does anyone know? Craft Guerrilla will be setting down their knitting needles next to City Hall on the South Bank to bring you crafty folk a selection of workshops. We'll be nestled amongst the trees in this little creative enclave with other talented creatures. There will be lots to do through out the weekend and maps will be available on the Craft Trail website, on the day from helpers and from each Craft Trail area. Follow our Twitter account to get up to the minute "special" info...we'll be offering a few "guerrilla" sessions through out the festival for a little bit of subversive crafting! 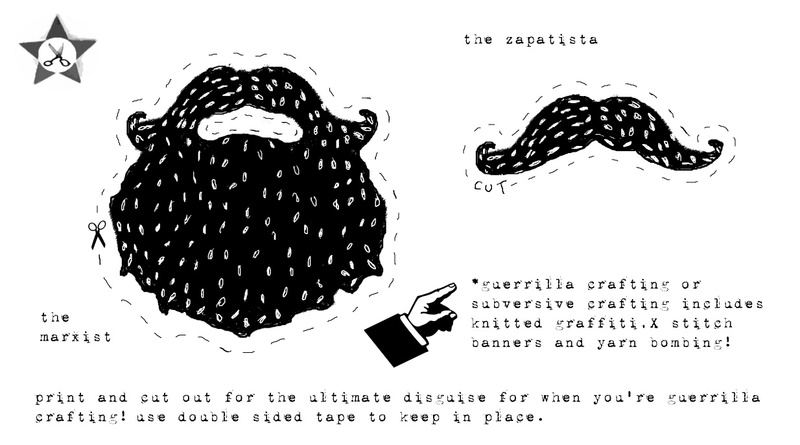 Also visit our web site's event page to download your free "Guerrilla crafter" disguise! In the City Hall area Craft Guerrilla will be joined by a selection of other designer makers, Cabbages & Kings, Creative Biscuit, Sanna Panda & Friends plus a few more yet to be announced. Wowzers now tell me there isn't enough CRAFT in the Capital! We'll have you full up to the brim with crafty loveliness by the end of the weekend. Times are tough and we're not the type to add to landfill so pop in and have a truly "Make Do & Mend" craftacular experience! Craft Guerrilla will be sharing their MD&M knowledge through a selection of ready to make craft packs. These showcase a variety of transferable skills that you can use on other projects around the home and for personal use. We'll be on hand to help and advise anyone that needs it. Also Frill Seekers Vintage will be there with their monthly boutique. By buying vintage clothing you are giving garments and apparel a second lease of life plus you'll have a quality one off item that you won't find in every High Street shop! Plus Claire Hair will be in residence with her pop up "Hair Booth". Get your locks into that ultimate retro do or go for a special hair and make up make over! 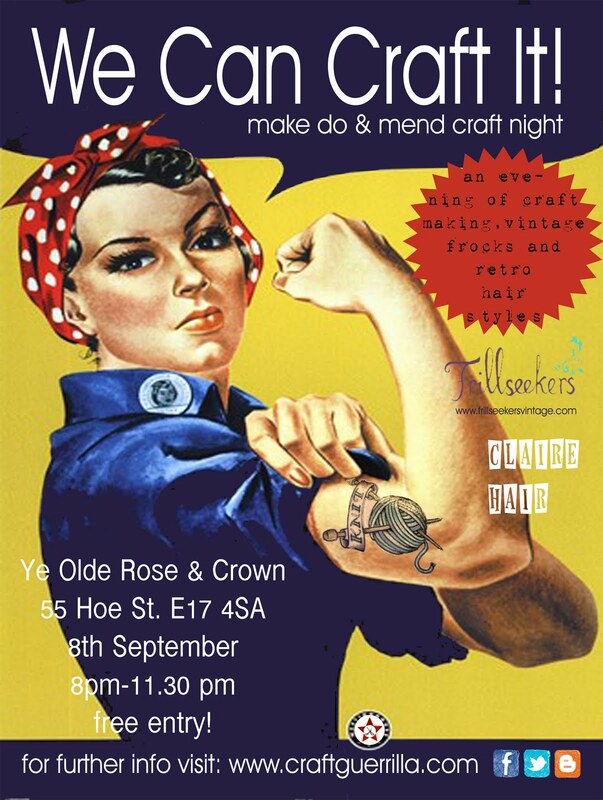 So if you fancy a bit of vintage fun join us on for a drink, great creative company and a very sociable crafting affair!!! Craft Guerrilla now available on KINDLE! That's right craft lovers... You'll never need to be without Craft Guerrilla! 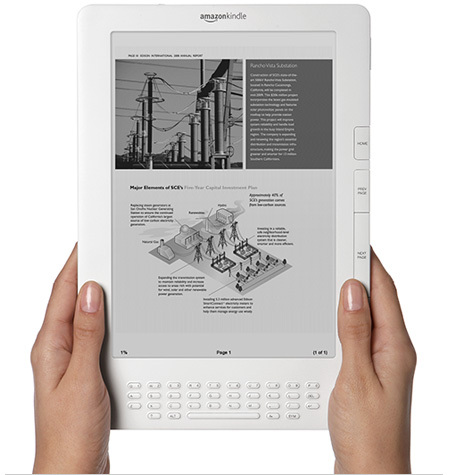 You can subscribe to our blog on your Kindle for a small monthly fee and we think that's pretty cool! For only 99p a month you can enjoy reading about our crafty shenanigans even when your sitting by the pool sipping a Piña Colada. It's a win win situation...this way you can read your novels and our blog on one handy device plus you won't feel guilty that you're again on the lap top when you should be relaxing! We know how easy it is to pick up the computer then lose hours because we get sidetracked on ebay! Available from Amazon: Click on the link here. Craft Guerrilla curates Finamore...Little Shop of Crafty Splendors! 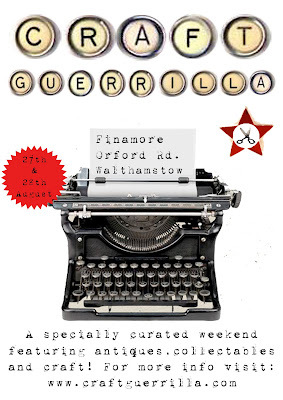 This August Craft Guerrilla are curating a very special weekend event. We've hand selected a few designer makers to showcase in this tiny but perfectly formed shop in Walthamstow Village. "Finamore" is a purveyor of fine antiques, collectables and quirky memorabilia serving as not just a restorer but also one of the first shops in the area to feature designer maker items. Craft Guerrilla are known for selecting high quality hand made goods so we see this as a perfect and splendiferous chance to showcase so you can come and buy some mighty gorgeous craft and delicious curios! Yet again we're feeling the vintage love and due to popular demand we'll be continuing with the "Make do & mend" theme! This month we'll be making the most of the theme by showing you how to use bits of pieces that you'd otherwise chuck into the landfill. Tusk, tusk, tusk...we waver our skinny index fingers at people who do! We believe that everything (well almost everything) can be either recycled, re used and reloved! Choose from the fab selection of ready to make craft packsor book your spot with the ever so talented Louise Batten of "Hello Battenberg". She'll be hosting this month's mini workshop. Louise will show you how to make a cute and useful item using traditional paper pieced honeycomb patchwork techniques which you can then use on other projects at home. Louise will teach you exactly what you'll need to make throws, cushions and quilts. Using those left over fabric pieces which you can't throw away this is a perfect project to "re use" and recycle. In these hard times you can't afford not to! PLUS...You'll leave the workshop with your own pincushion! £7 per person, all materials included.